While some reports that capuchins crack nuts or hard-shelled fruit to eat have already been presented, it has been unknown whether such behavior is only one of the varied feeding habits of capuchins or if it is also a behavior adaptive to their habitats, a behavior which requires the use of hands and mastering of skill related to tool-using behavior. 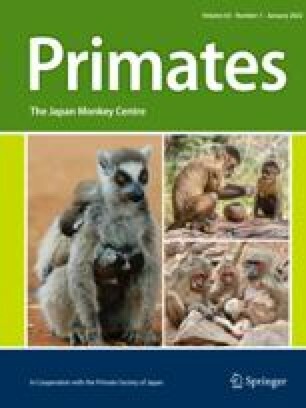 On a border of La Macarena National Park in Colombia, the authors minutely observed the feeding behavior of the black-capped capuchin, in which the monkey skillfully fed on the albumen of the fruit of cumare, a kind of cocoid palm-fruit, using two different methods, according to the degree of ripeness of the fruit. The characteristic behavior developed by the black-capped capuchin while eating the fruit of cumare could be fixed as one of the higher level adaptive behaviors of the animal to his habitat.